HAPPY 4TH OF JULY TO ALL OF OUR U.S. READERS! This month's newsletter has some helpful tips for planning your twin nursery! We're also featuring a cool log book that's sure to come in handy when you have twins. 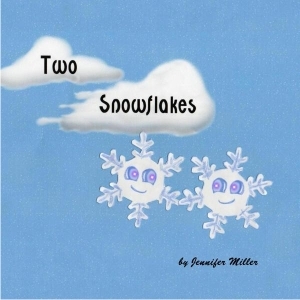 Don't forget to check out the June "Two Cute" contest winner and our "Featured Mom", Jennifer Miller. So, you need to plan a twin nursery. This situation may have some unique challenges depending on the size of the room and your budget. Many parents will choose to do a single nursery for twins out of convenience, due to the lack of an extra room, or just because. Regardless, a well planned nursery should benefit parents and twins alike. We have put together an informative series of topics (listed below) to help guide you in planning, furnishing, and decorating that special room. Aunt LaLa's Log for twins is a chic and stylish, handmade journal designed for keeping track of every diaper change, feeding and nap of both kids in one place! Every parent of twins will appreciate this helpful item, as it can get pretty confusing with newborn twins. You can pick one up in your choice of stylish and hip prints. Just Click Here for a special discount link for our readers! And be sure to type in promotional code TWINS to qualify. 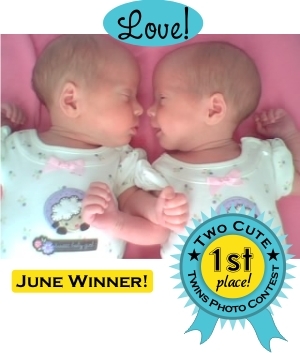 "Two Cute" Twins Photo Contest Winner! Here's Junes's winner! Love how their heads make a heart shape! 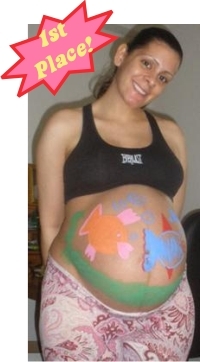 The Best Twin Belly Photo Contest! The prize was In The Womb - Multiples on DVD. This was a really fun contest which we look forward to doing again...stay tuned! 1) WHAT IS YOUR WEB SITE/BLOG? I have a few sites :-) First, there's TwinHappy.com which is home to my personal blog as well as twin-related articles/news, a community of Twin Moms, an ever-expanding list of Twin Moms (and Dads, Grandparents, etc.) on Twitter! (The latter of which also includes a weekly twin twitter party called #TwinTuesday!)... as well as a bunch of other little things... I'm always working on adding something new to the site! 2) HOW DID YOU DECIDE ON THIS BLOG/SUBJECT? 3) WHAT DO YOU ENJOY MOST ABOUT THIS SUBJECT? 4) DO YOU WANT TO TALK ABOUT ANY SPECIAL PROMOS, PRODUCTS, DEALS OR OTHER TOPICS? Well, I'm 34 and my husband is 39... we were both born and raised (and still live) in the suburbs of Baltimore, Maryland. I have two stepchildren who are now 16 and 18 years old, both of which have lived with us full-time for the past 2 1/2 years. They actually moved in when our twin girls were just 18 months old. It was an adjustment to say the least :-) But, my stepkids have also been a lot of help at times.